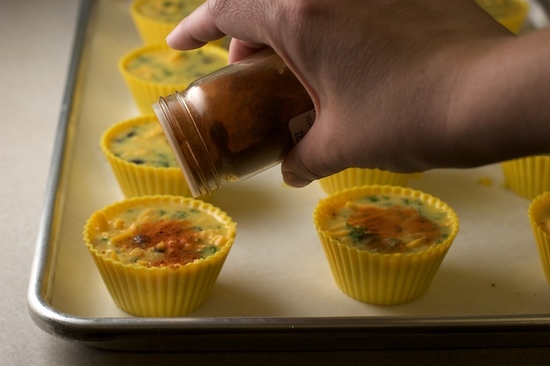 One of my many favorites from Kalyn’s Kitchen is her popular recipe for Egg Muffins. 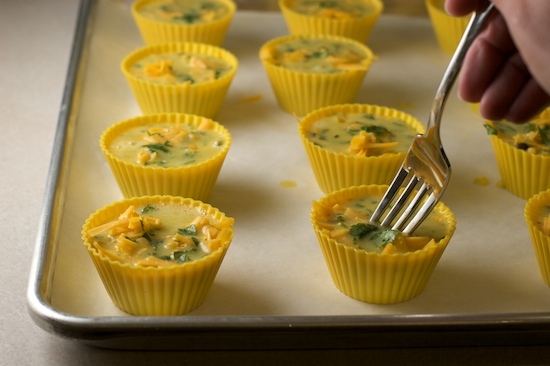 Egg muffins aren’t really muffins at all, they are more like mini omelettes baked in muffin cups. 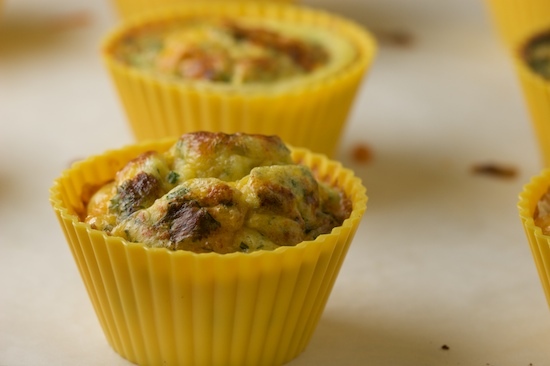 Turning the omelettes into ‘muffins’ makes them portable and easy to eat on the run. The great thing about these egg muffins is that they can be made in advance and heated up in the microwave on your way out the door. Brilliant! I first tried these at the beginning of the year to test out the great silicone baking cups I received as a gift from my cousin. That first batch turned out great and I was instantly hooked! Since then I’ve tried several different variations of egg muffins, using whatever I had on hand at the time. But today’s version was a brand new experiment. I decided to try a Southwest version by adding black beans, corn, and green chiles along with some pepper jack cheese. Normally you can’t really go wrong with that combination, but I have to say that I’ve never added beans to an omelette before, so it was definitely an experiment! Luckily, they turned out great! My husband and I have been snacking on them throughout the day and the few that are left over will probably be consumed tomorrow morning for breakfast. I’ve never been one to enjoy reheated eggs, but for some reason, these egg muffins seem to reheat very well in the microwave. I’ll give you the recipe of the muffins I made today, but be sure to head over to Kalyn’s Kitchen to read about her original version and the variations she suggests. She also has some great tips for storing and reheating. 1. Preheat oven to 375 degrees. Spray twelve muffin cups, either metal or silicone, with nonstick cooking spray. Don’t forget this step, the eggs will stick if the cups aren’t well greased, even in silicone! 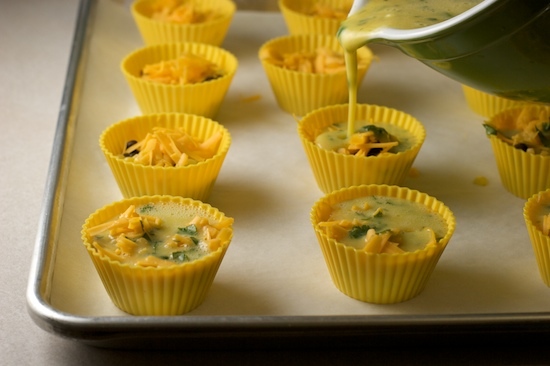 If you are using individual silicone muffin cups, arrange them on a parchment-lined baking sheet. 2. In a small bowl, stir together the beans, corn, and green chiles. 4. 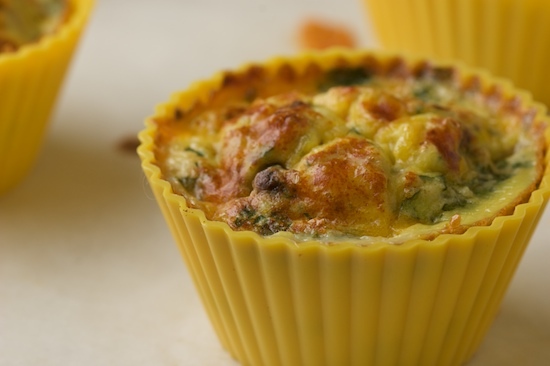 Divide shredded cheese between the muffin cups. 5. In a mixing bowl with a pour spout, whisk together eggs, sour cream, cilantro, cumin, salt, and a few grinds of black pepper. Fill each muffin cup with egg mixture, about 7/8 full. With a fork, gently stir the mixture in each cup. Sprinkle with smoked paprika (optional). 7. Place muffin pan on the center rack of a preheated 375 degree oven and bake for 20-25 minutes or until muffins are light brown, puffy, and the eggs are set. 8. Let muffins cool for a few minutes before removing from the muffin pan or cups. Loosen gently with knife if they seem to be sticking. Eat immediately or let cool completely and store in plastic bag in refrigerator or freezer. The Egg Muffins can be reheated in the microwave. Recipe notes: *To defrost frozen corn, I place it in a colander and run warm water over it for about a minute. **You will probably have some of the bean and corn mixture left over but don’t throw it away. I heated it up in the microwave, added some salt, pepper, and cilantro and enjoyed it as an afternoon snack! 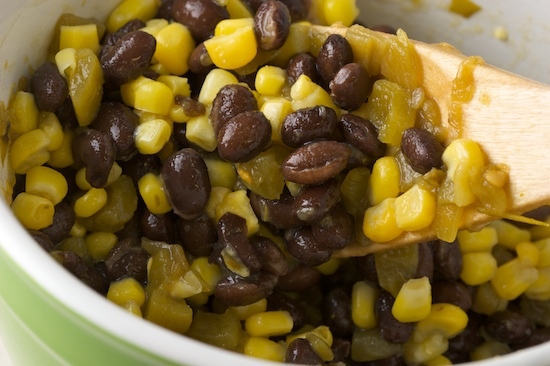 In a small bowl, stir together the black beans, corn, and canned green chiles. 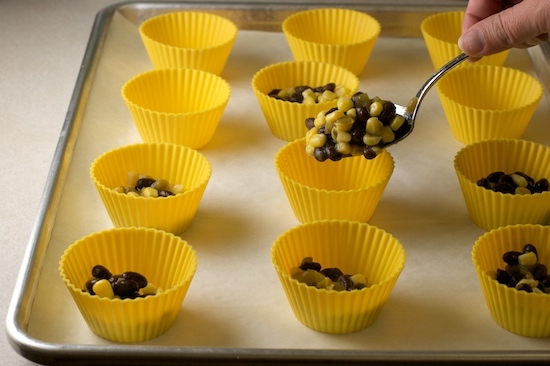 Place a spoonful of the bean mixture in each of the twelve muffin cups. 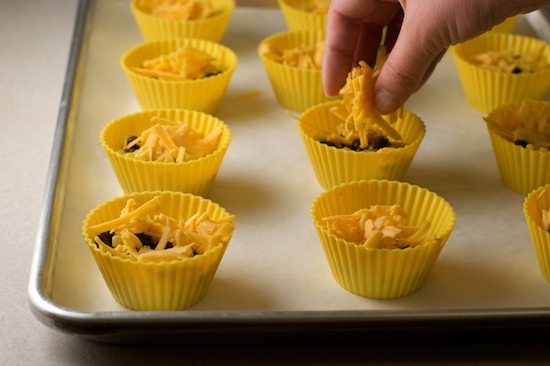 Divide the shredded cheese between the muffin cups. I wanted to use pepper jack, but realized at the last minute I only had cheddar. I still think pepper jack will taste better! Next, whisk the eggs, sour cream, herbs and spices together in a bowl with a pour spout. Then carefully fill each muffin cup with the egg mixture. Using a fork, gently stir the mixture in each cup. Bake the muffins in a 375 degree oven for 20-25 minutes or until the eggs are puffed, golden, and set in the middle. Hee! These are so cute and the flavours are awesome. After combining beans, chile, and corn. I put twelve heaping tbsps into another bowl along with the cheese, and stirred that into the egg mixture after whisking those ingredients together. Very nice combinations of ingredients. I recently made up a very similar recipe. http://bombaychowparty.wordpress.com/2010/11/05/quick-omelet-muffins-for-breakfast/ I was thinking I was being clever but then realized a lot of bloggers have cracked this! Your version looks VERY good. Will be trying this soon. Just wondering if the cheese could be omiited? as I am on a dairy free diet. Just wondering if the cheese could be omitted? as I am on a dairy free diet. Thanks for the many beautiful pictures. I wouldn't have figured out this recipe better even if it was a video.